Set-Times for Thurs / Fri / Sat / Sun . . .
CRAZY WEEK>>> and Next week the same.. Established noise/no-wave act, AIDS WOLF, will return to town, but this time to Denton at Rubber Gloves on Friday October 28th, 2011 along with HENRY And HAZEL SLAUGHTER (american tapes). Henry and Hazel Slaughter features John from WOLF EYES. This will be my fourth time to bring Aids Wolf through the metroplex, let’s make it great! yeah buddy… while I thought WHY? and OFF! 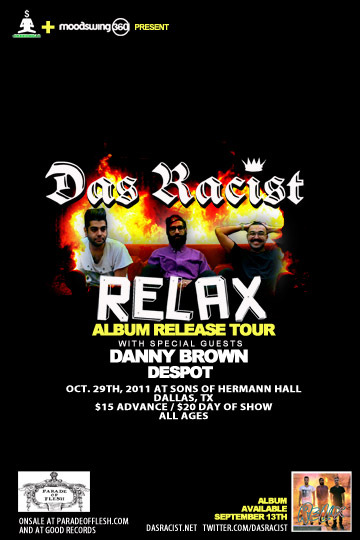 would be two of my biggest shows this Fall, I can now add rap act DAS RACIST to that list and on a Saturday night! Download and listen to Das Racist at their site. On sale now through frontgate tickets. One of my favorite current acts right now, CRYSTAL ANTLERS are coming back through (first time was with Times New Viking in June), along with the awesome Daniel Huffman as New Fumes and new band from Austin, BOYFRNDZ on Halloween! (Almost), actually this will occur the day prior, Sunday Afternoon, October 30th at Good Records. Long Beach, CA 5-piece, CRYSTAL ANTLERS have a new album out that was self released called TWO-WAY MIRROR, which has a limited 12″ available through their website right now. By coincidence, Ikey Owens of The Mars Volta produced both new albums by Crystal Antlers and Boyfrndz. Parade of flesh and Good Records presents . . . This entry was posted on October 24, 2011 at 11:30 pm, filed under News. Previous Post: Listen to Christine (mp3s) | Next Post: Do you like to write?